Aquaroche » How many rocks for my reef tank? In a reef aquarium, with the Berliner method, live rocks make the biological filtration. The quantity of rocks is proportional to the volume of water of the aquarium. Generally we use an amount of rocks equivalent to 10 to 20 % of the water volume, depending on the quality and density of the rocks. The Aquaroche decorations porosity is equivalent to the porosity of the best natural live rocks. Once the aquaroche rocks are seeded with bacteria, they can replace a great part of the live rocks you would have used in your reef aquarium. 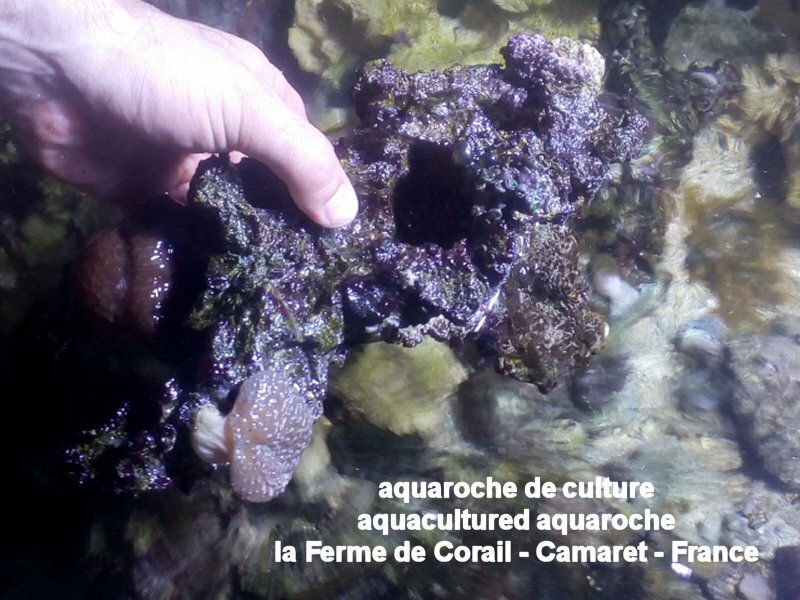 It’s possible – and this process has been tested over 20 years now – to equip reef aquariums with a large proportion of “new” aquaroche rocks and a small quantity of wild live rocks: they will bring natural strains of bacteria and micro organisms. The rock on the picture has been installed in 1999-2000 at the public aquarium “Océanopolis” in Brest-France. Structure: constructed by Océanopolis team. what’s natural and what’s artificial. Biological equilibrium of the aquarium is perfect. Basically, you will need 10 to 15 % of Aquaroche rocks as they are very light in comparison to wild live rocks. Example for a reef tank of 800 litres – 211 gallons you will take 80 to 120 kg – 176 to 264 pounds of (wet) rocks. Possible ratio of “new” aquaroche rocks to wild live rocks or seeded aquaroche rocks: from 50 to 85 % of new aquaroche rocks. Introduce in 1 or several times some very good live rocks to get a wide variety of strain of bacteria and micro-fauna. 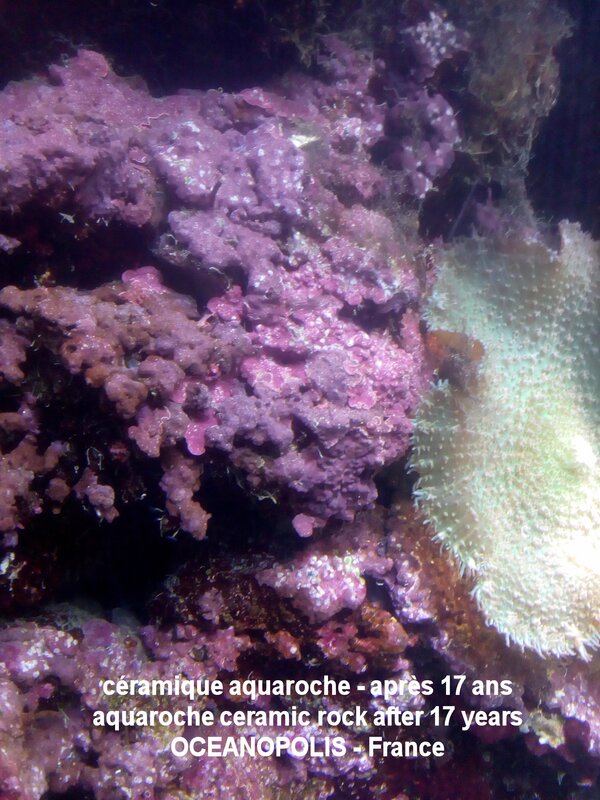 For several years now coral farms provide aquacultured aquaroche rocks, mainly the “ceramic rock” range, “eco reef plates”, and a selection of reef decorations among the “reef system” range: In France the “Ferme de Corail”. We have then 100% aquaroche reef aquariums, without depletion of the natural reef. One can use 100 % aquacultured aquaroche rocks or, like with live rocks, have a mix of aquacultured aquaroche + “new” aquaroche rocks. Here is a list of our products with their “dry” weight and their “wet” weight. Use the wet weight for a comparison with the weight of live rocks. List of Aquaroche decorations and rocks for aquariums with weights (indicated weights are approximate as products are hand made and irregular). 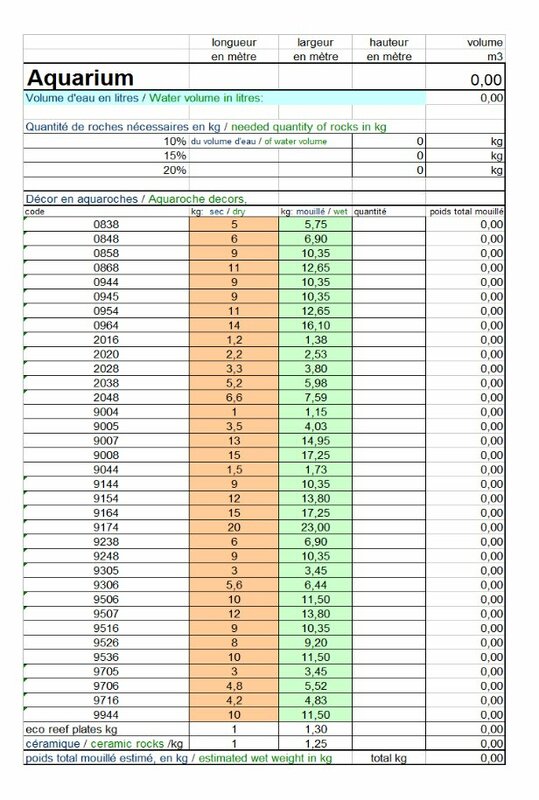 Contact us to receive the .xls version (for automatic calculation of weight). The rocks of the aquaroche reef system, the eco reef plates and the ceramic rocks are made from different and complementary raw materials: the one giving mechanical resistance and allowing the creativity in the shapes, the other one insuring lightness and porosity. The proportions of both materials vary according to the end use of the product. The sculptured rocks and structures of the reef scene system require a good mechanical resistance to support the mass of the decoration and the cantilevers; in return the porosity is slightly lower (approximately 15/20 %), finer and more closed on surface to get anaerobic zones into the heart. Eco reef plates and ceramic rocks are very close in composition, but we made the porosity vary so as to preserve anaerobic zones to the very heart of the rock, even with the fine flat rocks. The ceramic rocks have more important cavities connected by cracks. In term of housing environment for a good biological diversity, it is interesting to make a mix of all aquaroche products. Concerning the fresh water and cichlid fish aquariums, quantity of rocks is more a question of esthetics. However Aquaroche decorations play a role in the filtration and the rocks which you will use as decoration will have an action of always useful filtration for the maintenance of the tank, a kind of live rocks for fresh water.